When Google launched the original Nexus 7 in mid 2012, it threw down the gauntlet to its rivals by providing a high-performance yet affordable compact tablet. The Amazon Kindle Fire HD 7-inch and the Apple iPad mini soon followed with their own unique features, but now Google has rung the bell for the start of the second round. 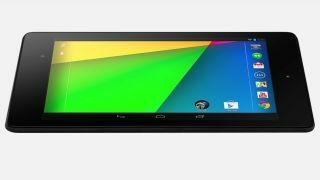 The second generation Google Nexus 7 has been revealed, and it's a formidable package indeed. In fact, on paper it would appear to leave both of the aforementioned rival devices in the dust. Here's how. Of course, the new Google Nexus 7 won't be available until July 30 in the U.S. and at an unspecified time over the coming weeks in other key territories - including the U.K. Meanwhile, you can pick up an iPad mini or an Amazon Kindle Fire HD 7-inch in shops or online right now. Google has bumped up the price a little for its new Nexus 7, with the entry-level 16GB model set to cost $229 and the 32GB Wi-Fi model $269. The top of the range 4G model will set U.S. customers back $349. Still, it remains significantly cheaper than the iPad mini, which starts at $329 (£269 here in the UK) for the 16GB Wi-Fi model. That's $100 more expensive than the equivalent Nexus 7 model. The 32GB iPad mini costs $459 (£449) and the 64GB model a whopping $529 (£429). The 32GB 4G model, which is equivalent to the top of the range Nexus 7, costs $559 (£449). Amazon's Kindle Fire HD 7-inch undercuts them both, with the entry-level 16GB Wi-Fi model costing just $199 (£159) and the 32GB costing $249 (£179). The new Nexus 7 comes with a meaty 1.5GHz quad-core Snapdragon S4 CPU, which compares favorably to the iPad mini's dual-core Apple A5 processor running at an estimated 1GHz. The Kindle Fire HD 7-inch brings up the processor performance rear with a dual-core TI OMAP4 4460 clocked at 1.2GHz. All three tablets utilize very different RAM setups. The new Nexus 7 leads the way with 2GB of RAM, while the Kindle Fire HD 7-inch has half that at 1GB. Bringing up the rear by some way is the iPad mini with 512MB of RAM, though it's worth mentioning that the Android OS running on the other two tablets is far more of a memory hog than iOS. All three tablets boast similar levels of stamina. Google claims the new Nexus 7 can withstand nine hours of continuous usage, while Apple pins the iPad mini at 10 hours. The Amazon Kindle Fire HD 7-inch would appear to win this round at 11 hours, but in truth all three last more than long enough in between charges. The new Google Nexus 7 will ship with Android 4.3: Jelly Bean, the very latest version of the Android OS. It's pretty much the same as Android 4.2: Jelly Bean, but with a couple of extra tweaks like restricted profile options and OpenGL ES 3.0 advanced graphics support. Apple's iPad mini runs on the latest version of iOS, which at the time of writing is iOS 6. Expect iOS 7 to be a real game changer. Finally, the Amazon Kindle Fire HD 7-inch runs on a heavily modified version of Android: 4.0 Ice Cream Sandwich - so heavily, in fact, that you wouldn't recognize it simply by looking at it. Amazon's own Silk UI has been layered on top, which simplifies navigation, pushes media content to the fore, and utilizes Amazon's vast server network to boost certain tasks through the cloud. Suffice to say, it's the worst OS experience of the three as result of such tinkering. Google's new Nexus 7 would appear to win this round hands down. Its display is massively sharper than the other two, with a 1920 x 1200 resolution resulting in a staggering 323 pixels per inch (ppi). It's by far the sharpest 7-inch tablet yet.